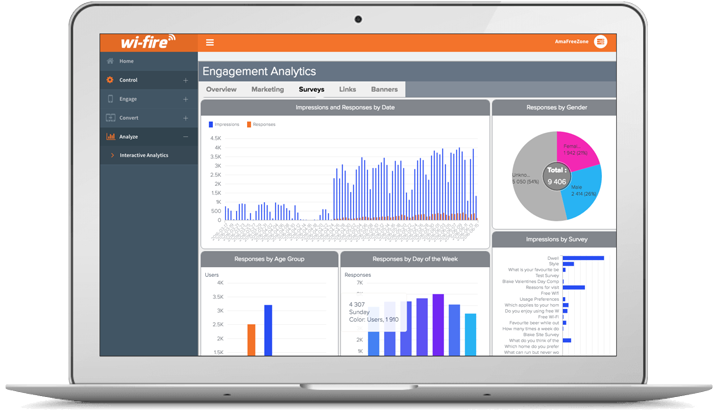 Secure and available at anytime, Wi-Fire’s analytics tools give you access to a wealth of real-time and historical customer data and insights. Learn about your customers and their needs to reveal a world of targeted marketing opportunities that deliver conversions like never before. Wi-Fire’s customer analytics tool turns data profiles into people. Gain a deeper understanding of your customers through valuable insights that change over time, just as your customers do, so that you can make better marketing decisions for your business. Graphs and tables tell an ongoing story of how specific demographics behave in your store, between stores, and away from your store. Use these insights to learn more about your customers; what they’re interested in, and which competitors they visit most frequently. Demographics, such as age, gender and LSM, location, dwell time, visitor frequency, visitor duration, most visited URLs, and data usage are just some of the statistics you can collect. Get a snapshot overview of your customers, or drill-down for more detailed reports. View, filter and export individual insights and entire analytic sets for easy reporting in graphic, document and raw formats. Get real-time and historical reports on specific or global trends at group, region and store levels. With Wi-Fire, you have peace of mind that your user data is safe, secure and 100% compliant with local and international data laws. It’s also accessible anytime, from anywhere. 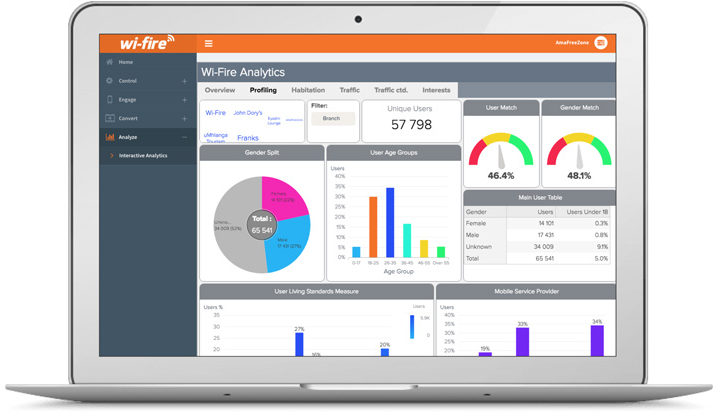 Wi-Fire’s engagement analytics allow you to measure the performance of your Wi-Fi marketing campaigns, such as surveys and adverts, against your sales performance for a true Wi-Fi ROI metric. 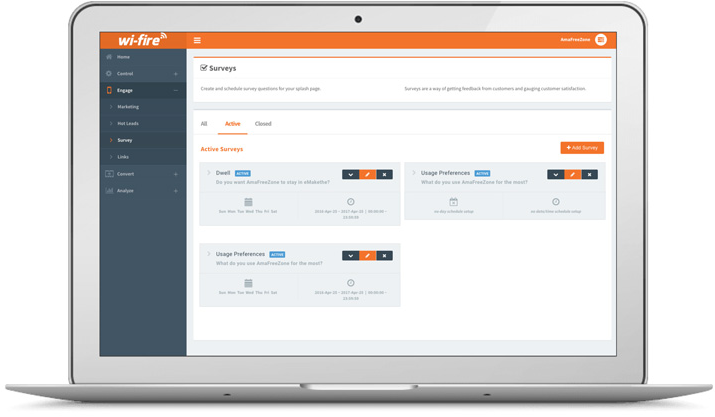 Capture customer feedback in real-time through surveys on your Wi-Fi splash page. Ask them anything and they will let you know what they think. Listen enough and you will know what they want. Turn knowledge into power by answering them through greater customer experiences.